View group member engagement in a convenient report linked from each group. See the number of members, posts, comments, likes, questions, and answered questions in a single view for each group. This feature is available in Salesforce Classic only. Anyone with permissions can view the group engagement report. 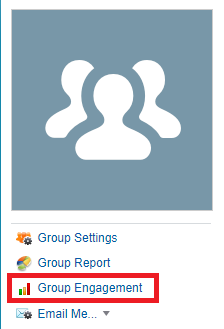 Group owners, managers, and other users with permissions (for example, users with the “Modify All Data” and “Manage Unlisted Groups”) can quickly access this report by clicking Show Group Report below the group photo.